So I was thinking about Conway's game of life and the ridiculous kinds of patterns that can be made (Things that move across infinite space etc) and then I thought, hey could a chess knight do this as well? The new definition of a "Neighbour" is whoever a knight could move to. 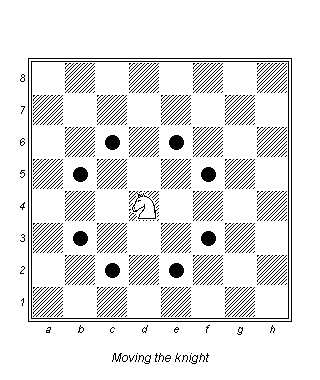 Knights can move in an L shape 2 squares in one way, one in the perpindicular. Alas they gave no example of these moving self-repeating patterns, so I wondered: Is it possible for knights in conway's game of life to traverse an infinite board in a repeating manner? Can you make a traversing infinite knight pattern? Can you disprove the existence of an infinite knight traversal? Can you make a generator pattern that will shoot off the infinite pattern if it exists. To be honest somewhat expect the disproval more than anything else due to knights sharing no more than 2 neighbors and various parity type things that may arise, but I hope there do exist patterns. So below is some base code for running the knight game of life in python. This is definitely not optimal (some kind of minesweeper like setup would probably be dope). But I hope this gives some interested people a good starting point. In order to glide there must be a side that is expanding (here we consider the case of moving right, without loss of generality). For this to happen at some point 3 points have to be left of the initial point to produce it. This is possible from 2 different conditions. 2 knights 2 blocks left and then 1 up or down with 1 knight 2 up or down and 1 left. The alternative is 2 knights 2 up or down and 1 left and a single knight 2 left and 1 up or down. 8's indicate where the new knight will be. I think I next am going to look more theoretical at how a white knight only attacking black squares affects potential interactions. Not the answer you're looking for? Browse other questions tagged mathematics computer-puzzle checkerboard knight-moves or ask your own question.